The questions we receive most often relate to concerns about retirement readiness and whether our clients investments are performing in line with their goals and if they’re protected from volatility. Over the years, the stock and bond markets have seen many ups and downs. A rising market over a period of months or years is called a bull market and a dropping market over time is a bear market. A drop of 10% or more is called a correction and a drop of 20% or more is considered a crash. Over the last several decades, the stock market has averaged being up 7 out of 10 years; and drops seem to be inevitable. It’s easy to feel comfortable when the markets are up, but during market drops many investors understandably get nervous. One of the best defenses against a dropping market is for investors to be honest with themselves about risk. Everyone likes risk when the market is rising, but most don’t when the market is dropping. In order to have a shot at 10%-12% growth over the long term, investors typically must take as much or more risk than the stock market itself. In a bear market, investor confidence is extremely low and can be a scary ride. To combat this, we recommend first reviewing your current investment risk. By running a volatility assessment, we can see how your current portfolio may have performed through market fluctuations over the past 15 years or so. Many of us remember what it felt like to see our balances rise and fall with the market in the longest running bull market. How would your portfolio as it sits now perform if there was a surprise repeat of past markets? The volatility report shows how much protection exists in a portfolio during dropping markets and how much growth is likely in a positive market. While we do not know the future, we can use the past as a clear reference to strive to improve the outlook. Second, we recommend diversifying your investments, allowing you to help control how much risk you want to take before a drop occurs. For example, we know from the past that European markets have fluctuated more than US large companies do on average. Your advisor and planning team can determine how much to allocate in those and other markets to adjust risk. Next, consider how much protection you want. Every dollar can be used to take risks to seek growth or buy protection. Growth and Income strategies use some funds for growth and others for protection. Investors give up growth potential to add protection and vice versa. While we all want no risk, high return investments, there is no such animal. Identify which is more important: Growth or protection and if you want both, which is more pressing. Finally, having an emergency reserve based on your cash flow needs helps to define the amount of time you can realistically ride out a storm. The stock market dropped over 47% during the 2008-2009 crisis. Many investors who did not have an emergency reserve but needed cash chose to sell at a loss. Many who feared that they did not have a good investment strategy during that time suffered losses due to panic selling. Meanwhile, the investors who did not have to sell typically saw their balances bounce back by around 2011. 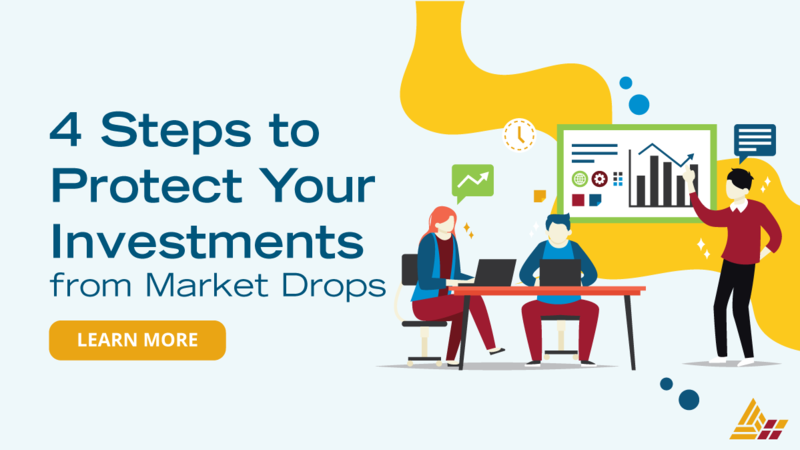 It is crucial to practice proactive planning and analysis to protect your assets from uncertainty; regardless of whether the market is up or down.